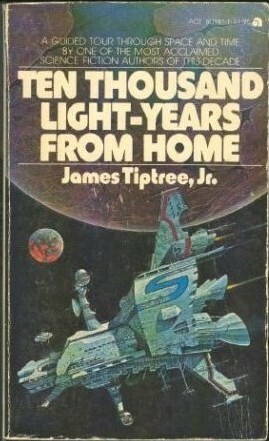 “The Snows are Melted, the Snows are Gone” © 1969 James Tiptree, Jr.
So… another long title, but that’s nothing new. It’s taken me a while to get around to reading more Tiptree, and then this story only took me about ten minutes to read. It was very short, and nothing much really happened in it. There’s a girl with no arms, and a wolf, and a naked guy. Really, that’s about it. Okay, but honestly, let’s get into it. What’s there to spoil? Well, the story starts with this armless girl and her wolf companion, who seem to have some kind of advanced, albeit post-apocalyptic-ruined technology, like radios and military rations and such. They find this tribe of seemingly more primitive people and managed to lure away one of the big men by having her strip and then run off. (The wolf helps her strip and get her clothes back on. It’s a very intelligent wolf.) Eventually, someone else comes who is a “boy” but seems very effeminate (“Houston, Houston, Do You Copy?” anyone? ), and has no legs (duh duh dun!) and helps get the guy onto a truck bed, saying things like “There’s your Y-chromosome.” which implies this is in a future world where most men have died, hence why they have to capture one. It also seems post-apocalyptic because the narrator makes a point of stating that when it gets warm there are no insects, and the story ends by stating this used to be Ethiopia. This means that as soon as winter is gone, as the title states, bugs should be swarming, however, something has happened to this world to not only kill off men, or make them sterile, but to kill off insects. We don’t ever find out what happened or what exactly is lost and what not. It’s one of Tiptree’s vague stories, that tries to make a point through round about ways. There’s some point in there about humanity and procreation and the endurance of women, etc, but it’s not very clear. I might have some sudden realization to the meaning later, but for now, that’s about all I can process. 2 out of 5 stars, because it’s not that it’s an awful story, it’s just a bit boring. At least it’s short.